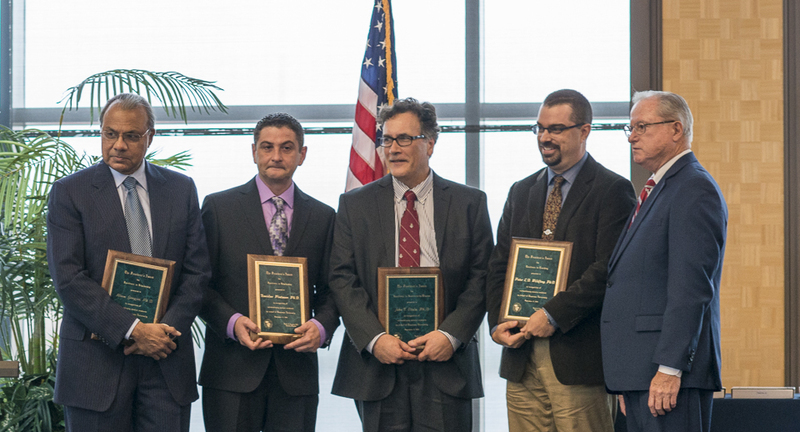 President Charles J. Dougherty recognized four faculty members with President's Faculty Awards for Excellence at the Sept. 11 convocation. 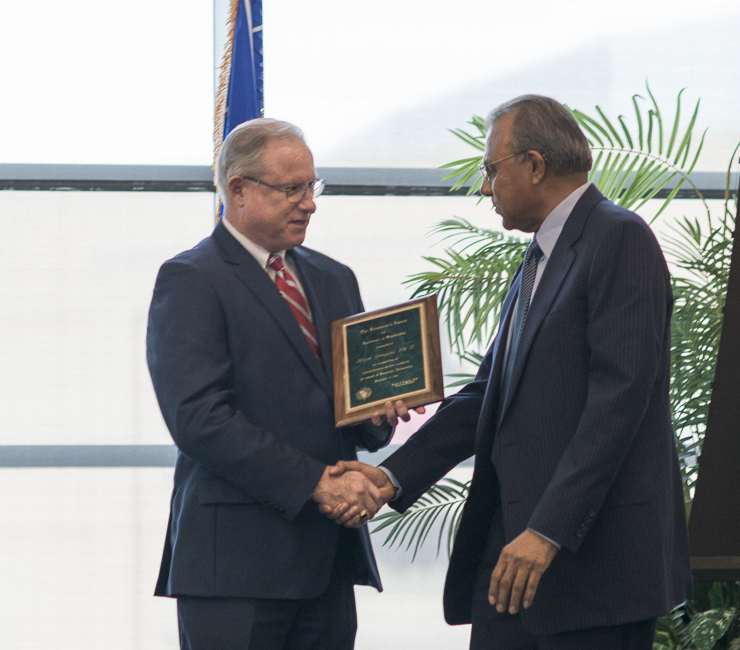 Since 1979, Gangjee has pursued his passions of research and teaching at Duquesne, attracting more than $18 million in National Institutes of Health (NIH) funding to Duquesne. His work has been supported by up to five concurrent NIH grants, and his research has produced about 40 percent of Duquesne's patent portfolio since 1976, generating the largest licensing agreement in the University's history. While excelling at research, Gangjee is outstanding in the classroom. The required undergraduate medicinal chemistry course Gangjee teaches is considered the program's hardest, yet, annually since 1988, students vote him among the top teachers in the school. Pintauer, an international leader in atom transfer radical addition reactions and atom transfer radical cyclizations, has produced two patents and more than 50 publications, and received more than $980,000 in research and instrumentation grants. Students he has mentored have received recognition from the National Science Foundation (NSF). 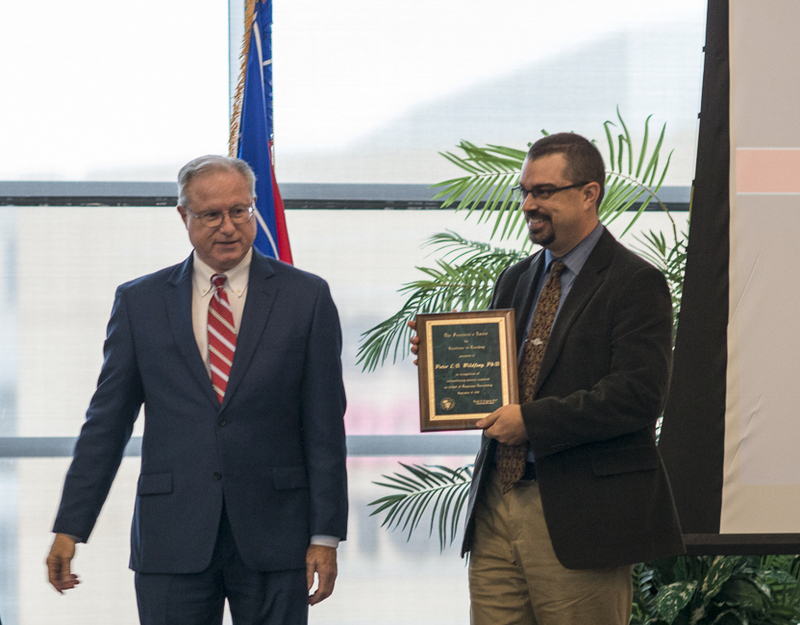 Pintauer himself was honored with an NSF CAREER Award-only the third such award in University history-which considers research quality and how a candidate will incorporate research with teaching. Pintauer's work, some of which he co-authored with undergraduate and graduate students, has been cited more than 1,000 times. Wildfong has won teaching awards from the dean of pharmacy, the University, first-year professional student pharmacists, and the Omicron Delta Kappa national leadership honor society. His two pharmaceutics courses are rated at the top in the first professional year of the pharmacy curriculum, despite their difficulty. Besides instructing pharmacy and chemistry students, his teaching extends to federal regulators and industrial scientists and to 8,000 elementary children at the 2012 USA Sciences and Engineering Festival. Wildfong's dedication to helping students learn and retain information has resulted in publications on pedagogy and has been extended to his colleagues. Stolz has given nearly 70 presentations across five states related to Marcellus fracking-volunteerism that takes hundreds of hours and aligns with the University mission. He has participated in roundtable discussions with federal, state and local organizations; counseled religious groups; and raised more than $50,000 through grants to stage a free, public two-day symposium on shale gas extraction last year. Stolz, who monitors water quality as part of the 3 Rivers Quest program, has served on the editorial board of six journals and numerous national granting panels, and is a longtime board member of the RiverQuest environmental education group. Charles Stegeman, Mary Pappert School of Music.